Tyrone Mangold with a solid yellow tail kingfish. Finally the weather has broken and we have a rapidly fading easterly swell combined with light north easterly winds which has seen everyone who owns a boat head out after the schools of pelagic fish. With the recent drop in swell the bar crossing has been far easier this week especially toward the weekend. Many anglers have had the chance to get amongst it and catches of mackerel have been reported with some very sizable Spanish caught. Now is the time to use pilchard floaters and slow trolled dead baits around Sunshine reef and Jew Shoal. If In a kayak then launching from Noosa main beach and taking a short paddle over to Jew Shoal is worth a look as is heading toward Halls reef. Be sure to have a Spaniard Special out the back and rig up a big bait for the big fish. Further out to Sunshine Reef we have seen some very nice catches of coral trout, pearl perch, various cod species and the occasional kingfish. Dropping floated pilchards on gang hooks is the best way to find other mid water species including bigger snapper, cobia and longtail tuna. Crossing the bar has been a lot easier and the local reefs have been fishing well. 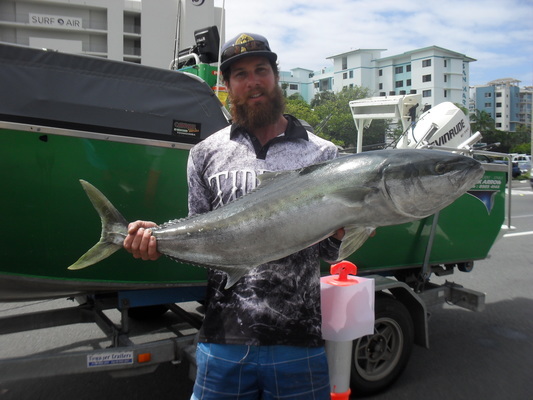 Out wide North Reef has had a great mix of reef fish and pelagic’s including the main target, Spanish mackerel. Also in the mix are smaller cobia, sweetlip, pearl perch and longtail tuna. The surf fishing has been a little quiet with the clear waters, but there are some quality gutters up and down the coast. The better times to fish are low light but during the daytime light rigs and beach worms are the go for whiting, bream, dart and flathead. In the river the Dog beach, River mouth and along Gympie Terrace have seen some quality flathead caught. If you want to target one of the larger fish then live baits are the best. If able to fish at night then try larger hardbodies to attract the attention of the bigger fish including mangrove jacks. Trevally are in greater numbers during the early mornings so take a walk around Woods Bay, Munna Bridge and along Gympie Terrace. Surface walkers and smaller poppers are great ways to trigger a bite when cast into a feeding pack of fish. If using soft plastics then keep your baits to 2-3 inches in size and use lighter jigheads to keep a natural action. Borumba and Lake MacDonald have been providing anglers with quality Saratoga and bass, especially for those anglers using surface and suspending lures. No matter where you fish try to take shelter from the northerly winds during the last and first light times for the best results. Frog and cicada style lures are effective this time of year as they are both very active so be sure to have a few in your tackle box.